As followers of Jesus Christ, we believe that God calls every person to a spiritual journey that helps one to grow in hope, faith and love. Jesus gave us two great commandments, to love God and to love our neighbor. We want to live out those commandments by actively serving God and our community, by worshiping together as a faith family, and by growing in our spiritual journey. Conviction that God has mercy and love for all people. Holy Communion is the highest sacrament of the United Methodist Church. The sacrament is also known as The Lord’s Supper, The Last Supper or Eucharist. In communion, we remember God’s saving work through the life, death, and resurrection of Jesus Christ. We celebrate Communion in worship on the first Sunday of each month and in our proud tradition, this Sacrament is open to all people, whether member or guest, believer or seeker. Holy Baptism is the sacrament of initiation that joins us with the church and Christians everywhere. Baptism symbolizes our new life in Christ Jesus and God’s forgiveness of our sins. We understand that the power of this Sacrament is not in our actions or words, but in the power of God’s Holy Spirit claiming us as ‘His Beloved.’ Therefore, in the United Methodist Church, people of all ages, including infants and children may be baptized. In order to fully understand our celebration of the Sacraments, you must also understand our proud Wesleyan Theology. Because of what God has done for us, we offer our lives back to God through a life of service. So as disciples, we become active participants in God’s activity in the world through mission and service. Love of God links to love of neighbor and, as a result, to a passionate commitment to seeking justice and renewal in the world. To learn more about the history and beliefs of the United Methodist faith, please visit www.umc.org. For over 150 years, the Methodist presence vitally influenced our community. The Forest Methodist Church began (1861) during a time of great turmoil when our nation felt torn apart by the divisive politics of the Civil War. Through the devastation of those years, and during the years of reconstruction and recovery, the Methodist Church existed as a community and example of faith and healing. This proud legacy of faithfulness and hope continues in the life of her people today. 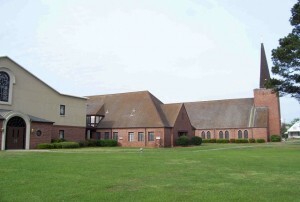 From her humble beginnings in a log school house, FUMC has known four buildings, including the present church, constructed in 1957 (Family Life Center added in 1994). During its history, visionary leaders blessed FUMC, their faith and tenacity continue to lead as we seek to meet the needs of an ever changing, ever growing Family of Faith. This brief history is taken from the work of Church Historian Marian Sistrunk for the 150th Anniversary.